We have completed a new look for the ACTC website which hopefully will make it easier to find the information you want. So far only the home page will be changed, the the changes will be replicated throughout the site. We have had positive comments so far. The header is a combination of the previous image and new text. On the left side is a new collapsible menu. The menu opens up initially with the choice Quick Links. These are links to the mostly used sections of the ACTC website and will save time looking for these commonly used links in the other menus. 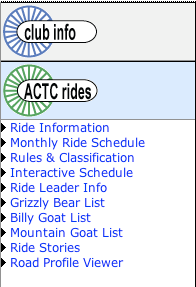 If you click on each major section, such as ACTC Rides, the menu options for that area are shown. Across the top is a duplicate horizontal menu. Just move your mouse over any section and a drop down sub menu will appear. 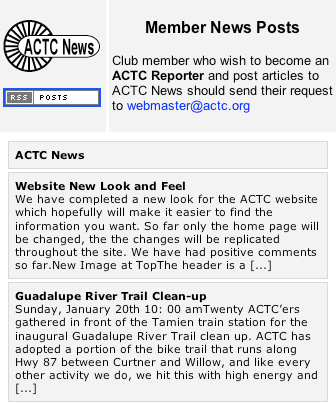 We also have added a RSS feed to the home page from the ACTC News website. 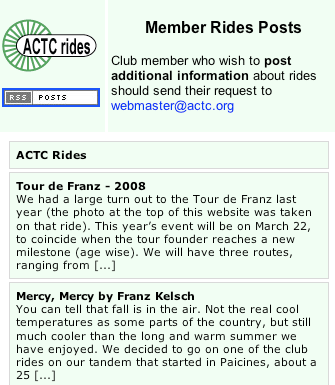 We also have a place where members can post information about upcoming or past rides and it will show up on the home page of the ACTC website. You can links to the most recent photo galleries here. If you are using Firefox or Safari you will also see a thumbnail image of one of the pictures from that gallery. Click on the link to go to the ACTC photo website. Be sure to visit the ACTC Website and let us know what you think at webmaster@actc.org. Twenty ACTC’ers gathered in front of the Tamien train station for the inaugural Guadalupe River Trail clean up. ACTC has adopted a portion of the bike trail that runs along Hwy 87 between Curtner and Willow, and like every other activity we do, we hit this with high energy and a great sense of fun. The club contributed 40 total hours to cleaning up the trail. We gathered up a lot of junk, swept up broken glass, painted over graffiti, and gave the city a good “to do” list for repairs and repainting. Though everyone worked hard, it was a fun, social event for all! After approximately 2 hours of work, we regrouped in the parking lot for a group picture in front of our newly formed pile of junk. We cleaned the trail, and it was now the City’s job to pick up the garbage! Not quite ready for lunch, most of us took an entertaining tour of the crazy (but useful) Guadalupe River Trail. We then ended our day at Deb Wade’s house for a well deserved lunch. Thank you Debbie and Randal for inviting us over! ACTC will be hosting “trail clean-up” days every month. Look for the next event on February 10, and join us for a fun, new, social event! 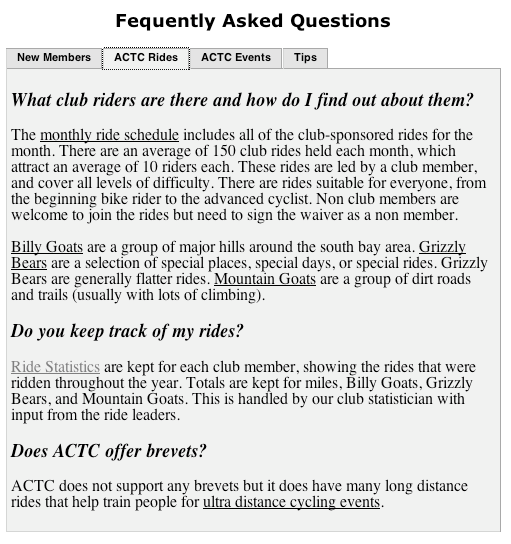 We have added a Frequently Asked Question section to the ACTC website. There are tabs for different areas. 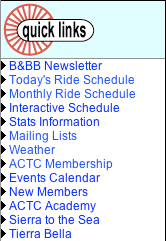 If you click on the ACTC Rides tab you will see this. If you have a question and don’t see the answer here, it is a good question to add to the FAQ page. Just send your question to webmater@actc.org. The February ride schedule now will show up online in our online database. Bookmark these Quick Links for future use. Included in this edition is an article on sports nutrition by Deborah Lefferts, Tour Tested by Rick Madden, Traveling with a bicycle by Michael McGeough and an article by Karen McGeough, along with many other features. The printed version is currently at the printer. 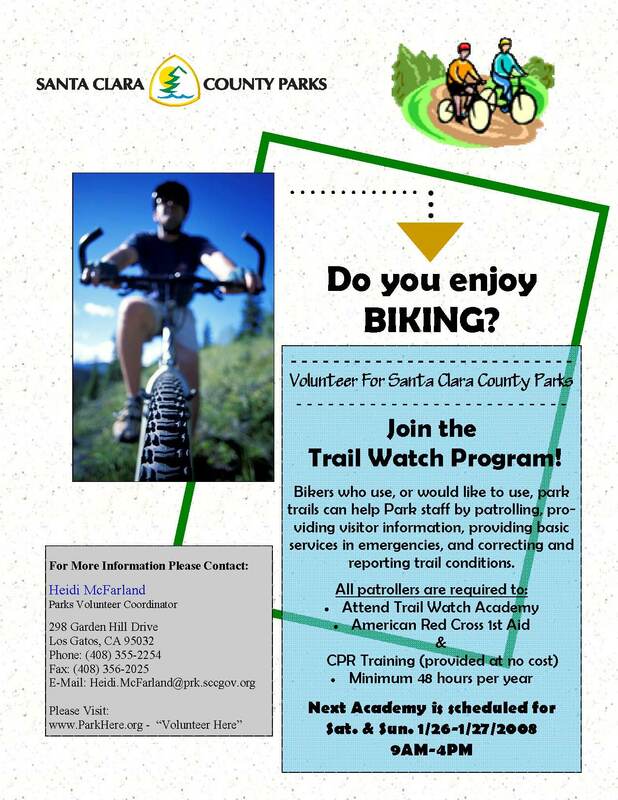 The following information was received about the Santa Clara County Parks Volunteer Program Trail Watch Team. Click the following link for a PDF flyer.